It's time for Chicken Farm Bakers' Project again, for this month my friend Aummy, want us to bake for some one special "Chicken Farm Bakers' Project # 17:Bake for someone special for his or her's special day". There are so many special day in one's life, birthday, wedding day or etc., but for me only thinking about the chance that we have to know people and have friends is making everyday in life special. So, I want this chance to cerebrate the day that we know each other and this buns is for all of my friends. I got the recipe of the choux pastry from someone who live so far away from me, and we'll never know each other if I didn't start writing blog. 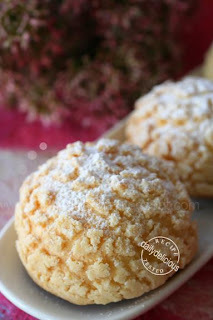 I really like the idea of using microwave for making the pastry (it's very easy to use this method). Actually it's like boiling the ingredients but you just pour the ingredients into the cup (or bowl), it's quicker and it's really good in a hot day, ^ ^. This Maria Buns is an adaptation from the book:(if you remember that there was the project: Bread baking around the world that I had to make Scandinavian bread, so I bought some books on Scandinavian baking, this book is from that time, too). 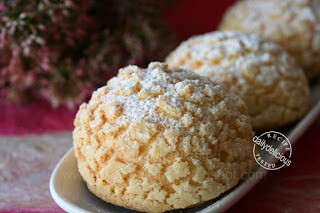 The Maria bun is a mix of the choux pastry with a cookie dough and fill with cream, when sprinkle with an icing sugar, it looks like a snow ball. So, let me give this lovely bun as a gift for all my friends, because you are special and hope everyday of your life is a special day. Combine the flour and sugar, add the butter and cut it into the dry ingredients, kneading lightly. Warp in the plastic and refrigerate for at least an hour. Preheat the oven to 200 °C Line baking sheet with waxed or parchment paper. Pour the water, butter salt and sugar in the microwavable bowl. Heat the mixture for 2 minutes, or until boil, then pour the flour over the water mixture and stir to combine. Put the mixture bake into the microwave and heat for another 1 minute. Take the bowl out and stir until there is no steam coming out of the mixture, add the eggs one at a time, beating after each egg has been added to incorporate it into the dough. In the end the dough should be thick and shiny and when lifted it should fall back into the bowl in a ribbon. Pipe the pastry on the prepared sheet pan. Roll the cookie dough to a 3 mm thick sheet, and cut out 6 cm circle. 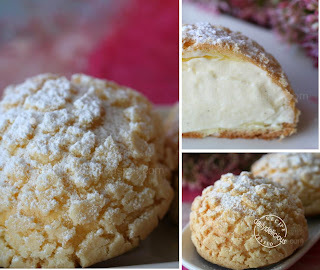 Place one cookie on each choux pastry. Bake for 20 minutes or until lightly golden and hollow. Reduce the temperature to 150°C and bake for another 5 minutes. 1) In a small saucepan, bring the milk to a boil. In the meantime, combine the yolks, sugar, vanilla bean, and cornstarch together and whisk in a heavy‐bottomed saucepan. 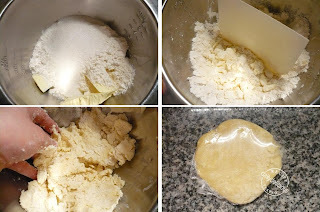 4) Scrape the pastry cream into a small bowl and set it in an ice water bath to stop the cooking process. Pour the cream into a bowl. Using a balloon whisk or electric beaters, whip until soft peak form. Pipe the filling into the pastry, and dust with icing sugar. One question - does the choux pastry bake with a crispy texture? Mine always ends up soft instead of crispy, which is how I would like it. If you let the choux dry completely (by bake it at the low temperature) your choux will come out crisp instead of soft and moist. I finally did this today, and it's fantastic! It was a hit with the family. Thanks for the recipe and tip. 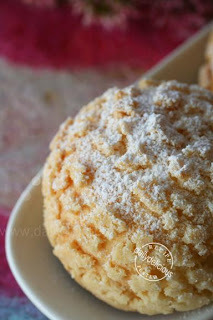 For the choux pastry, the batter should be not too runny or too thick, ^^. I know that when seeing from the photo you can't tell. i think you need to reduce the amount of the egg that you use (don't pour all the egg at once, check until you got the batter that you can pipe it). Because the amount of the egg that i give is only a suggestion, you will need more or less it depends on how dry your flour is. How big or what size is the choux pastry when you pipe it? :) looking forward to do it for my mom's birthday and she would love this,:) thanks! The choux pastry is about 5.5 cm. ^^, Hope your mom enjoy this. Does the cookie dough "scatter" nicely just by placing the cut dough on top of the pastry? my craquelin fell off from the choux. could you tell me whats wrong. after i removed from the oven, i let it in room temperature for 3 hours. 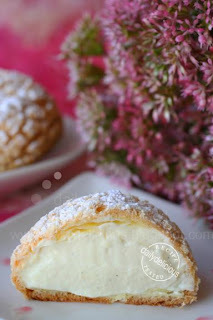 after that i fill with custard and the craquelin fell off from the choux. I never had that problem before but you may prevent it by spraying the water over the choux pastry before placing the craquelin.